Service trucks from Chimney Saver Solutions frequently visit the Richmond VA area suburb Mechanicsville VA, in neighborhoods such as Holly Ridge, Fox Head, Mill Valley, Queens Lace, Ash Creek, Beechwood Farms, and others. Our trucks travel on Rt. 1101, Rt. 56, Highway 295, Atlee Road, and many more Mechanicsville roads to perform chimney services such as chimney inspections, chimney cleaning, stove installations, and chimney rebuilds. Homeowners in the Mechanicsville VA area call Chimney Saver Solutions for chimney cleaning, chimney inspection, and more because our chimney sweeps are licensed and certified by the Chimney Safety Institute of America (CSIA). Chimney safety is not an issue to be taken lightly because of associated dangers such as chimney fires and toxic gases that can be released in the home if there is damage in the liner. Our experts are fully trained in the operation of the chimney system, which is more complex than many realize. The chimney repairs we offer to Mechanicsville VA homeowners and those throughout the surrounding area include repairing and replacing chimney liners and chimney crowns, detecting and fixing leaks, and repairing masonry. We make recommendations based on honest evaluations and never recommend chimney repairs that are unnecessary. The clay liners that are commonly installed in masonry chimneys eventually crack and deteriorate, which creates hazardous conditions. Adding a new stainless steel chimney liner will provide you with peace of mind and improve the function of your chimney system. A replacement liner is typically recommended with installation of a fireplace insert, as well, to ensure proper and safe operation that delivers the heat. Chimney crowns are at the top of chimneys, and they need to be inspected routinely. It is not unusual for cracks to develop in chimney crowns, which can result in moisture entering the chimney system and potentially causing extensive damage. When conducting chimney inspections of Mechanicsville VA homes, our expert chimney sweeps always examine the crown. We also recommend waterproofing, which can create an additional barrier against water damage. Chimney caps and chase tops may be considered accessories, but they are actually as important to a chimney as a roof is to your home. 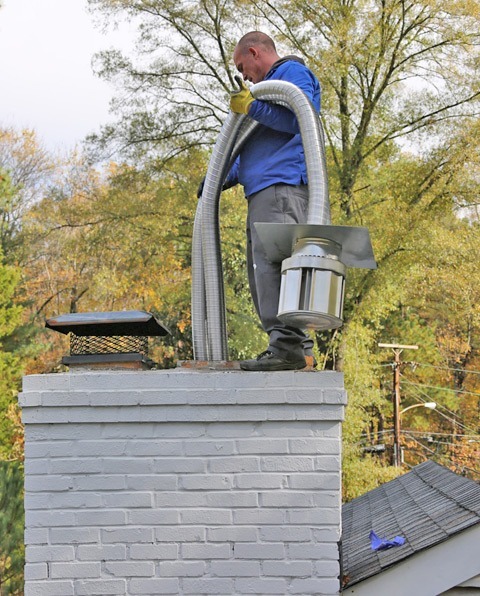 There are numerous benefits to scheduling chimney cap installation with our experts. Chase tops and chimney caps in Mechanicsville VA keep out animals and debris. Most importantly, they keep out rain, snow, and sleet. Certain chimney caps have mesh that serves as a spark guard, to provide protection against hot embers that might escape and catch combustible materials on fire. Without ongoing maintenance, chimneys can deteriorate to the point of needing restoration or complete rebuilding. If caught in time, weakened mortar can be scraped out and replaced using a process called tuckpointing. It is essential to entrust chimney rebuilds and chimney restoration to chimney experts who understand how the complete chimney system operates. The expertise of our chimney technicians includes the knowledge and experience to provide optimal chimney repairs such as rebuilding and restoration. There are many potential causes of a leaky chimney, and the damage caused by leaks is often difficult to detect. It’s important to fix leaky chimneys as early as possible, to prevent extensive and costly damage from occurring. The sooner you schedule an inspection, the sooner you can address any moisture problems that exist. Among obvious moisture issues are weakened masonry, deteriorating mortar joints, and cracks in masonry. Contact our chimney experts for wood, gas, and pellet insert installation. We will meet with you at your home to assess your specific needs and suggest the best fit. We have sold and installed fireplace inserts in many homes throughout the Mechanicsville VA area. Professional installation provides optimal safety and operation, in addition to extra peace of mind. If you have been looking for ways to cut utility costs in winter, we recommend considering a wood, gas, or pellet stove for your home. There is a wide array of styles and sizes to fit any space in your home. Stoves provide numerous benefits, including a reliable way to maintain heat and a means for cooking in your home in the event the electricity goes out in harsh weather. Our chimney experts have made wood, gas, or pellet stove installations in many homes in and around Mechanicsville VA.